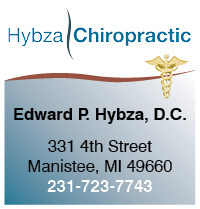 A Manistee native, Dr. Hybza is a 1985 graduate of Manistee Catholic Central High School, attended Michigan State University and graduated from the National College of Chiropractic. He received his Doctor of Chiropractic degree in August of 1992 and began his practice in Manistee in September of 1992. Dr. Hybza is committed to helping you achieve your optimal health. He says,"Regular chiropractic visits can have a positive impact on a person's overall health. Chiropractic health care can help a person function at a much higher level. We can implement a treatment plan designed to help ease the pain and suffering a person is experiencing." Dr. Hybza is very pleased to have on-site massage services provided by Brooke Sage LMT. Massage therapy is often used before or after chiropractic treatment and can help increase circulation, boost the immune system and decrease muscle tension. Dr. Hybza is married to his wife of 14 yrs, Jeanne and they have three boys; Henry, Peter and Andrew. He enjoys living in beautiful Northern Michigan, being outdoors, playing with his children and entertaining his friends and family. In additional to his high professional standards, he has a great personality, making patients feel at ease and comfortable. He is a member of the Elk's Club, Manistee Golf & Country Club, Saint Joseph Church, Manistee Chamber of Commerce and the Michigan Association of Chiropractors.